Last weekend, Emma and I made a trip to a local Farmer’s Market in a city 15 miles away, called Denton. I’ve had my fair share of doing the HUGE Dallas Farmer’s Market but I thought I would find somewhere local closer. We don’t quite live in the sticks but we are 30 minutes from downtown Dallas. Since Josh was at his cabinet making class all day, and I wanted to hit up the market before the season ended, we hoped in the car and headed north. If you’ve never been to a Farmer’s Market, they’re actually pretty fun. You get to see what local crafts, soaps, food trucks etc. abound along with actually meeting a farmer. What’s that? You haven’t met the person who grows your berries that come allll the way from Guatemala? That’s bizarre. I figured it was high time to start living the way I want while getting baby girl acclimated to my whims. Not that she doesn’t love her weekly trips to the store, with her ‘Emma-sized shopping bag,’ but we needed to branch out. Down the road, I’d like to make this a weekly tradition with the whole family (if we’re not growing our own). You can’t beat spending a little QT with the fam on a cool Saturday morning, traipsing around for some local produce. Emma seemed to have fun and even let me babywear her around the booths…until she saw doggies. I really wasn’t there to get any homemade toys or soap, so I honed in on the produce and EGGS! 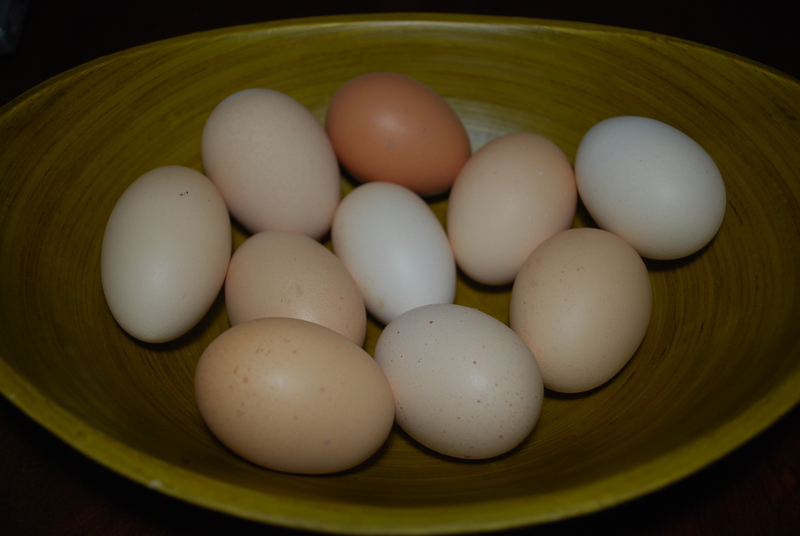 For what seems like forever, I have been wanting to get my mitts on some farm-fresh eggs. We usually buy the cage-free ones from Costco, but once again, I wanted them straight from the source. I was stoked to find these little beauties for $3.50/dozen. Another booth had them for $5/dozen. Yes, it seems crazy to pay that much for a dozen of eggs that will only last us half a week, but you can’t beat knowing the source. Also, who knew that NOT ALL EGGS ARE THE SAME COLOR! That has me wondering what’s going on there and how many good eggs are being tossed because they don’t look uniform…things that make you go hmm. Since I was trying to be good with our budget, I only planned to spend the $15 cash I had in my wallet. This is what we came home with and I don’t think it’s too shabby. Look at the size of those plums! I swear I’ve never seen a plum that big yet be as juicy and sweet as this one was. 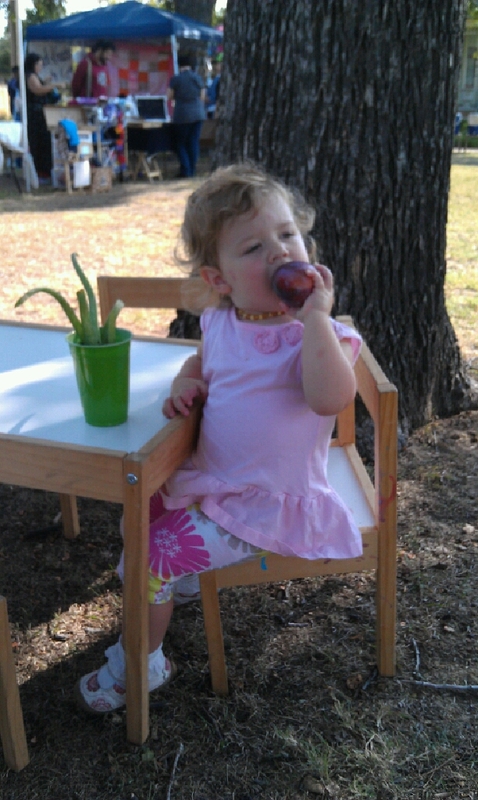 Emma couldn’t help herself and wanted to sit at the ‘little table’ to enjoy herself. Oh, we also picked up a little aloe plant since I’m wanting the fresh juice from that as well. Let’s just say these, along with food co-ops, are awesome. After my friend Casey went to a Weston A. Price meeting, she told me about a local farmer who ran a CSA. She said they were willing to offer work shares to people since they were behind on transplanting and were being over taken by weeds. 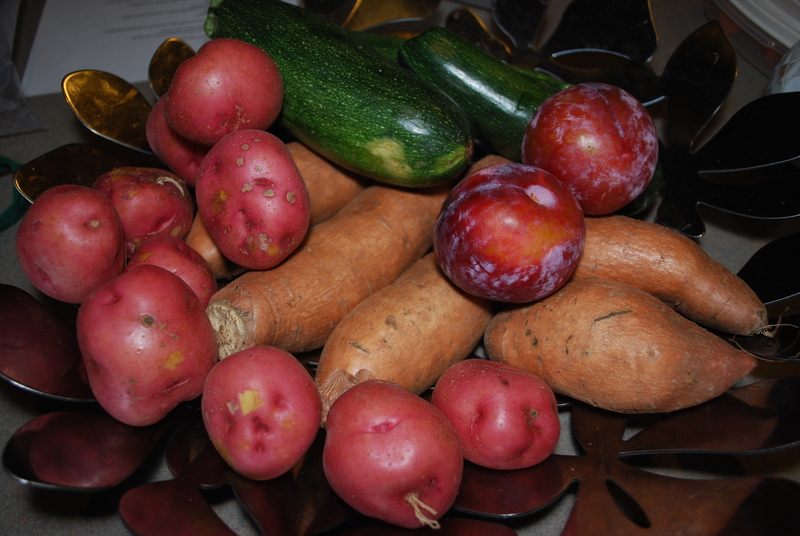 The work share would basically supplement your share of produce by you working in the garden. Heck ya! Work for your food and learn some tips along the way, sign me up. I also thought this would be a great opportunity for myself and Emma; so I put a call in to see if they needed some help. Farmer Pete, from Red Wheelbarrow Farm, said he did need help, since people kept bailing out, but that he couldn’t offer any shares at the moment. I told him that didn’t matter and if you need help, we’re your gals. I made sure it was okay for the doodle bug to tag along and he said of course. We decided to make into two separate shifts during the week so as not to make her go crazy bored. Today was our first day doing it and I had a blast! Granted, I’m the girl who loves meaningless tasks in an office, but that’s beside the point. After Pete gave us a little tour of the 2 acre garden, literally on a busy street in Plano, we got to work. Our job was to transplant some lettuce he had grown in trays into the actual garden. Emma did pretty good the first hour, but then lost interest, feigned tiredness, and wanted a snack. I don’t blame the girl-I get pretty cranky when my belly is empty. So, after an hour and a half of work, we I planted about 100′ of lettuce. It didn’t look like a lot of work but boy did it get my feet to going a little numb. My takeaway was that I need to learn to plant straight. Poor Pete is going to have to go back and fix my curvy lines. That’s okay, lesson learned. As we were about to leave, he brought us this. I wasn’t expecting to get anything but was excited to get something grown from his two hands! He also let Emma snack on a few sun gold tomatoes that had just ripened…that totally made her day. 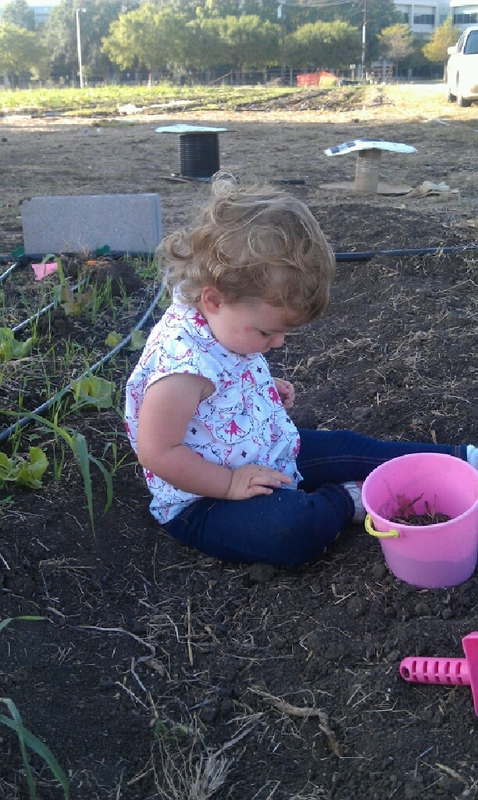 All and all it was a great experience, and I have to say I respect the heck out of people who grow and raise our food. They literally work from sun up to sun down, year-round. Of the many different jobs I’ve had, I can never say I was able to take off without a substitute (well except maybe at the theater). Much to my surprise, Farmer Pete said he could use our help again. We will head back out on Thursday and I plan on getting a few garden tools for Emma along with a dump truck to keep her occupied. All and all, it was a very peaceful and eye-opening experience. Have you ever heard of such a thing? 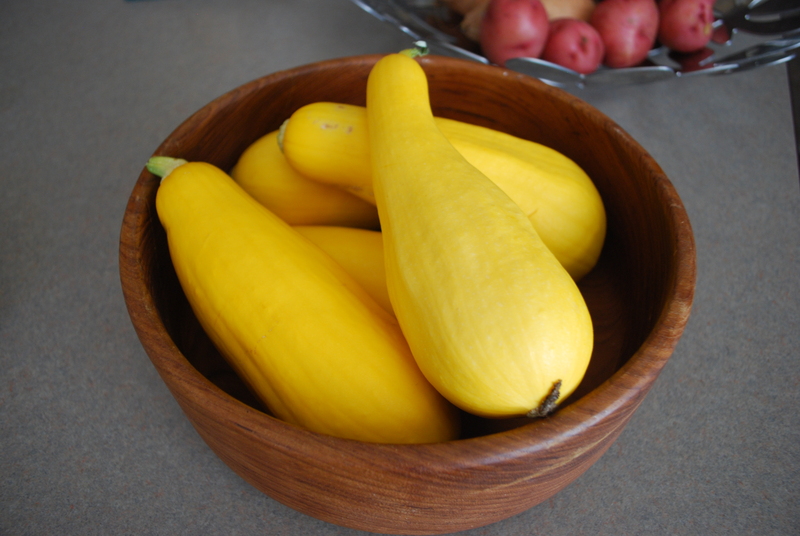 Do you and your family regularly go to Farmer’s Markets, or are they even close to you? 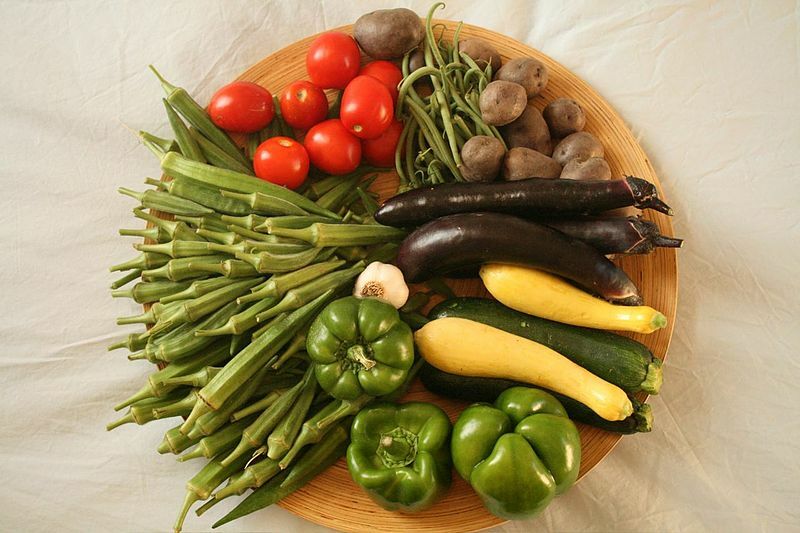 Have I sparked your interest in joining a food co-op or CSA? Check into it if you’re curious. 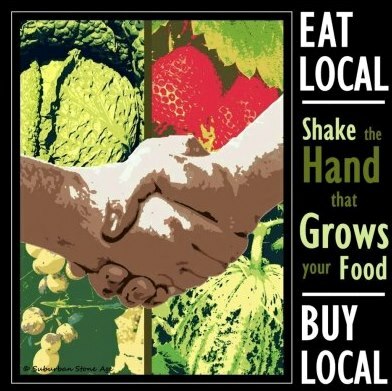 Now go, get out there and start buying local! 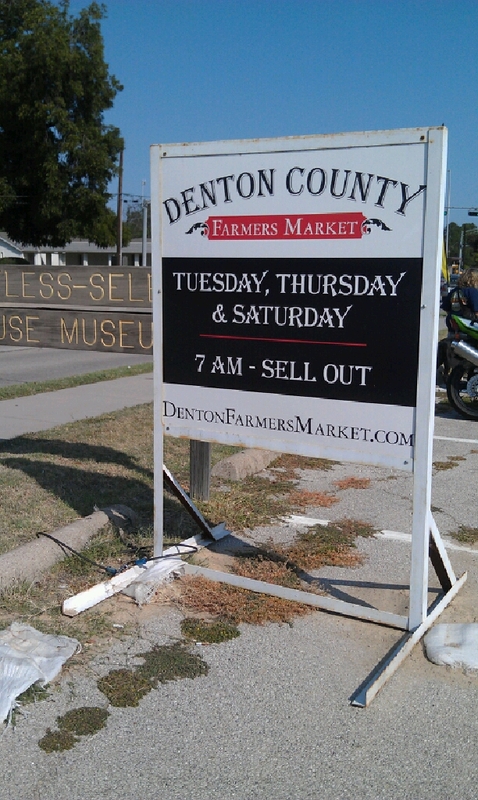 I’ve never been to the Denton Market – it looks great. Have to give it a shot. You’re welcome! Glad to find local markets and be able to support them. Let me know what you think of it. Woohoo! 🙂 So glad you had fun. I can’t wait to go.